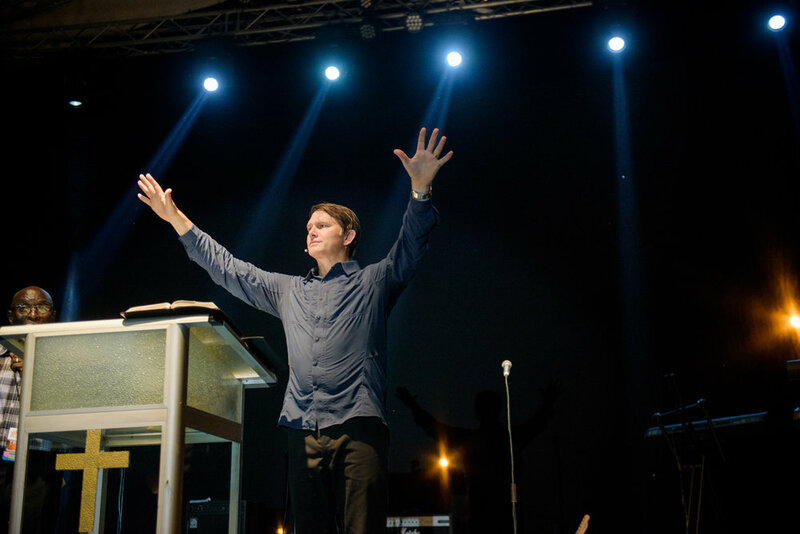 As part of a ten-year campaign to saturate Africa with the Good News of Jesus Christ, Andrew Palau is joining with hundreds of churches and thousands of believers in Côte d’Ivoire (Ivory Coast) to hold a multi-year, multi-city, interdenominational evangelistic campaign. Evangelistic efforts in 2017 focused on the city of Yamoussoukro, the political capital of Côte d’Ivoire. NGA partner evangelists joined in the effort by focusing on the nearby city of San Pedro. God willing, this will feed into even great evangelistic opportunities in 2018-2019 as we focus on the larger, economic capital of the nation, Abidjan (population 4.7 million). Scroll down for updates from Côte d’Ivoire. Day 1 of the festival was a great success! Great crowd. Great spirit. Great response to the Gospel. Reports of attendance and decision numbers are still coming in, as well as photos from the evening. Below are a handful of the first few photos from the night. 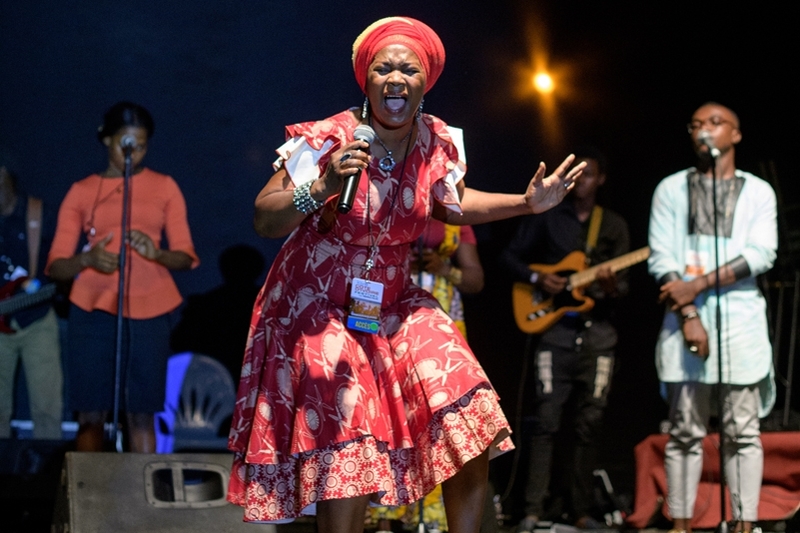 Thousands turned out for the first day of the festival in Yamoussoukro. Local musicians entertained the crowd throughout the night. Local believers - along with Palau team members - followed up with decision makers at the festival. Andrew leads the crowd in a prayer. A Friend of the Festival shares with a girl who responded to the Gospel. Andrew and his translator go over their notes backstage. A local musician entertains the crowd. 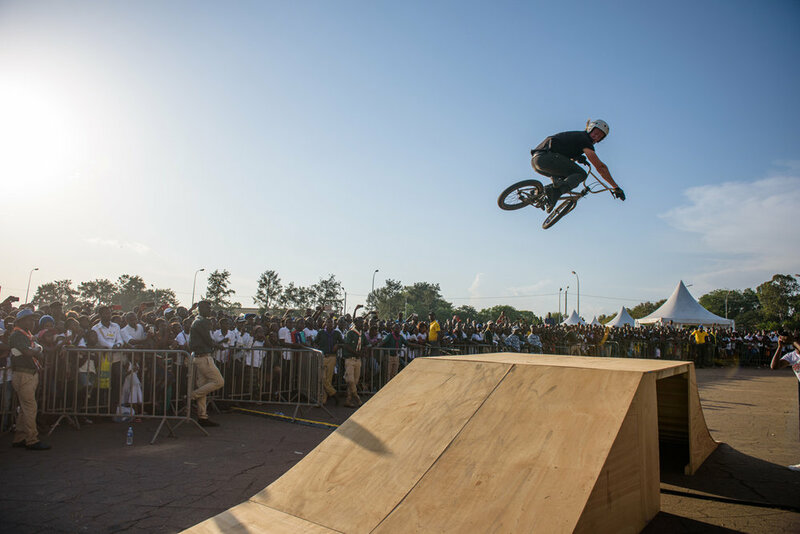 Youth respond to the Gospel message during the BMX demonstration. Vic Murphy shares his testimony during the BMX demonstration. Dave Lubben shares with the crowd. John Andrus performs tricks during the BMX demonstration. Hello prayer warriors from Abidjan, Côte d'Ivoire. We arrived last night and this morning was the press conference here in Abidjan. Andrew did an amazing job sharing the vision for the festival and also clearly sharing the Gospel with all the press in the room. Very powerful time. The welcome we've received is humbling and our great joy and pride is to tell the people of Côte d'Ivoire that there are many praying for them. Andrew did so in the press conference and we will continue to encourage the local leadership with this truth every step of the way. It means so much to them to know you are praying! So please don't stop. Of course there are many little obstacle being thrown up along the way, as always seems to be the case. But the Lord is with us and will lead us in triumphal victory. Now we drive to Yamoussoukro this afternoon. We'll meet with the mayor and executive committee. Please pray for the women's dinner tomorrow night and business dinner on Thursday. Thank you all. You're a blessing. Andrew and Wendy Palau arriving in Cote d'Ivoire with Wendy's parents. Andrew meeting with his translator. Andrew and the local festival committee at the press conference in Abidjan, Cote d'Ivoire. Andrew, Wendy, and the team praying with the local leadership team. 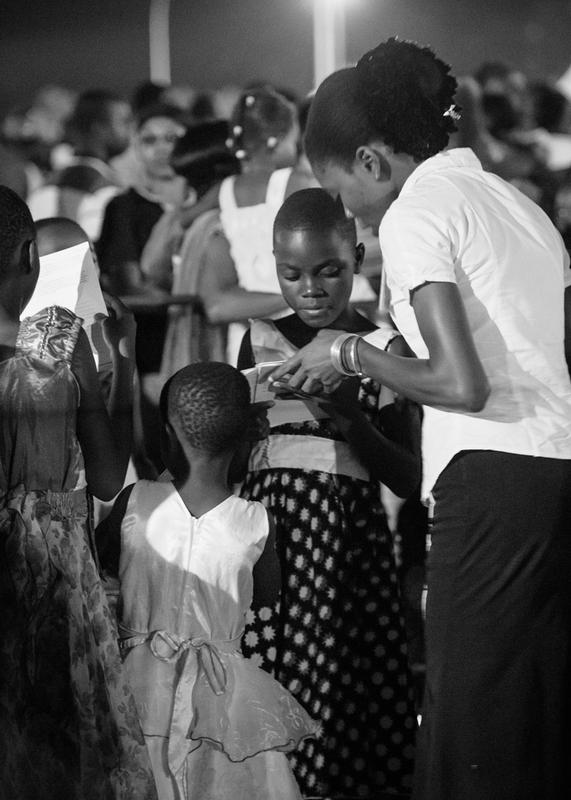 Thanks for praying for us here in Côte d’Ivoire. It’s been a great few days since we all started arriving in country. On Sunday we were in 6 churches preaching and saw many decisions for the Lord. 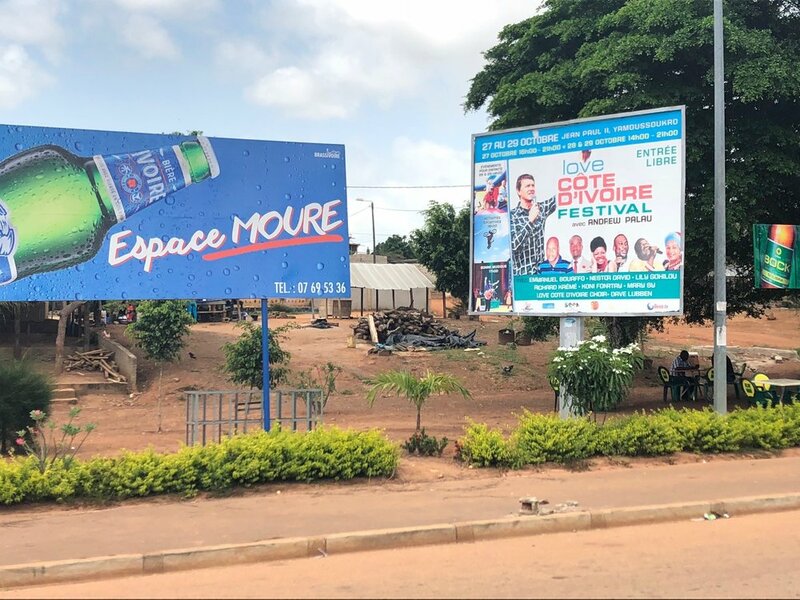 There is good publicity all over town and people know Love Côte d’Ivoire Festival is happening. The team is amazing and I am so thankful for everyone on the ground who is working super hard. Today Doug Horley (Duggie Dug Dug), Vic Murphy, John Andrus and Dustin (BMX team) began in the schools. This is a huge victory all by itself. One week ago we received permission to go into the schools from the education dept in Abidjan. Initially we were told we would not be able to have any programs in the schools. We now have a full program arranged. This morning they were will around 1500 kids and this afternoon two more schools. I decided to stop in and visit the programs today and as I was watching Duggie Dug Dug I was introduced to a leader who was very excited. It turned out he was the President of all the primary schools in Yamoussoukro. He stopped by to see the program and told me he was going to go and call every headmaster in Yamoussoukro to send all the children to the festival Saturday and Sunday. He also wants to send all the teachers to supervise the children. Thats a miracle and a huge blessing. Let’s pray that thousands will come and we see a huge harvest for the kingdom. Keep praying for the 100,000 Bible’s to be released from the border. We have a clearing agent now working to get them through. Andrew, Wendy, and the rest of the team arrive today. Tomorrow we have our press conference in Abidjan, followed by meetings with various dignitaries. 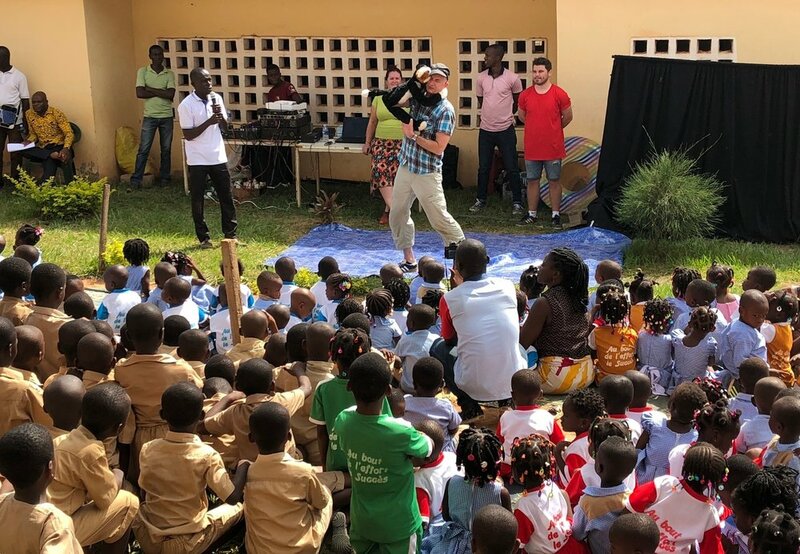 Dougie Dug Dug sharing the Good News in a school in Abidjan. Vic Murphy sharing his testimony during a BMX stunt demonstration. Several schools in Abidjan opened their doors to our team this week. Publicity for the festival has saturated the city of Yamousoukro. Everywhere you go in the city you are surrounded by reminders of the festival.